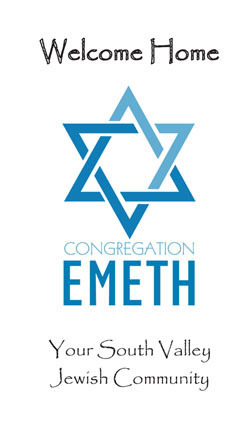 Congregation Emeth consists of a group of individuals and families who believe in the value of a strong Jewish identity. We celebrate the richness of our Jewish heritage, honor the work and commitment of those who came before us and are dedicated to building a strong, cohesive and connected Jewish community. As Reform Jews, it is important to us that we demonstrate our religious beliefs. We offer a rich set of programs and services including religious school, adult education, Shabbat and holiday services and social activities. We encourage you to find your place within the congregation to apply your talents, your professional expertise, and most importantly, your passion for Judaism to support and advance the good work the congregation is doing. Congregation Emeth welcomes people from diverse Jewish backgrounds and traditions. We embrace interfaith families as well as non-Jews who are on the path to conversion. We welcome LGBTs. Come learn with us! Come celebrate Shabbat and holidays and help us bring Torah alive! We are waiting to welcome you, to have you become part of our congregational family. Thank you for your interest in Congregation Emeth. We strive to make our temple a warm and inviting place for all members and visitors. We are happy to welcome you to worship, study, and celebrate with us. Join us for Shabbat or another event that interests you. Meet our members and Rabbi Israel. There is no need to RSVP, but if you let the membership team know you will be attending, we can be sure to have someone there to greet you and introduce you to others. Email Emeth’s administrator admin@emeth.net to join our “Friends of Emeth” email list and receive our weekly eNews (HaMadrich) and monthly flyers. Review our Welcome Brochure (PDF), containing an overview of Congregation Emeth’s membership benefits. Looking for more specifics? Please email the membership team membership@emeth.net or call us at (408) 778-8200. We would be pleased to mail or email you a packet of information including our most recent newsletter, our brochures (Social Action / Education / Programming for Young Families / Sisterhood), our calendar of upcoming events, and/or a membership application form. Complete a Membership Application (PDF) and mail it, with your payment, to our office.